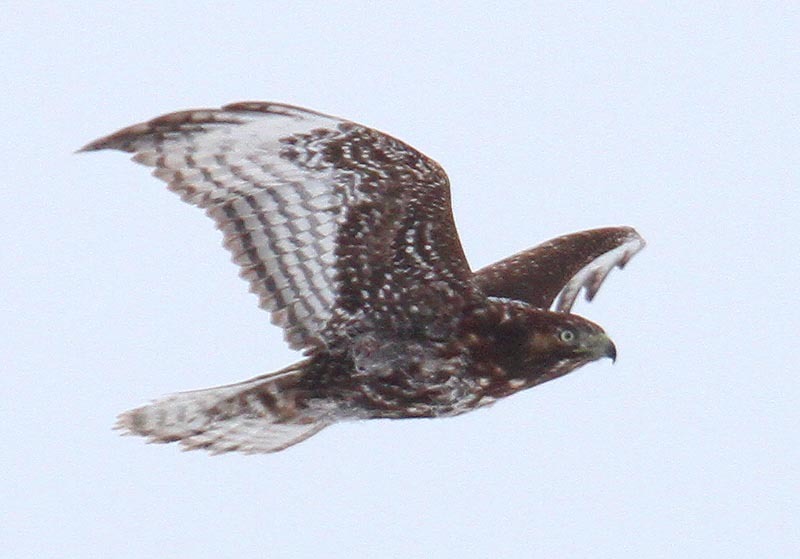 This hawk was seen in Sheep River Prov Park, in SW Alberta, Canada (eastern slopes of the first mountains). Date: Oct 5, 2018 at 11:30am. The tree this hawk was perched on overlooks a steep canyon on one side. I was thinking immature intermediate swainson's, but can we eliminate that based on the light eye? Otherwise it would be red-tailed. Swainson's would also have primaries extending beyond the tip of the tail. I'd call this an immature Red-tailed Hawk, possibly Harlan's based on how dark it is. I believe Harlan's is consistent with the heavy white mottling, white throat, and white around the eye--though that rectangular "frame" around the eye strikes me as really weird. If I'm not mistaken, the white throat makes other dark-morph Red-tails a tough sell. I was thinking that, but couldn't really make out tail from wing. Red-tailed was my feeling as well, but just wanted opinions. Here is one more photo showing the breast and undertail a bit better. Almost doesn't look like the same bird. The bill really threw me off too, seems to have a very short gape if you zoom in on it (lips seem not to extend into face or under the eye). The head shape is almost like an apple, with a vertical like slope before the bill. Overall threw me off. This was October, and a cool day. There were not a lot of other birds around, only a few white wing crossbills. This Hawk was clearly hunting, and flew off over the ravine, after I watched it for about 5-10 minutes (almost walked right up on it). Hawk options that came to my mind ... Immature Dark Broadwinged? Immature Dark Red-Tail? Immature Dark Swainson's? I've seen both the Harlans and Dark Broadwinged about 10 miles east of here (more in the foothills/prairie), including Harlans and other Red-Tails. Unusual to see a Swainsons in the mountains, but could be. That picture seems helpful. Now I'm wondering about a heavily marked juvenile light-morph Broad-winged, though a dark subterminal tail band would be nice. 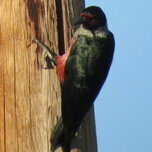 But since I've never seen a Broad-winged, I really don't know. I was googling Alberta Birds of Prey. What about a Sharp Shinned or Immature Northern Goshawk? And this one's facial pattern matches. if this one were a bit younger, it would have white spots on its back and a striped tail. Immature Red-tails are basically splotchier versions of the adults. Note the frosting around the wing edges on the secondaries. The dark tail tip ID point still stands - both dark morph Rlha and bwha have substantial dark tail tips. Conclusion: this is an Immature Harlan's Red Tail Hawk ... with an odd white "frame" around it's eye. thanks for your clever collective help!